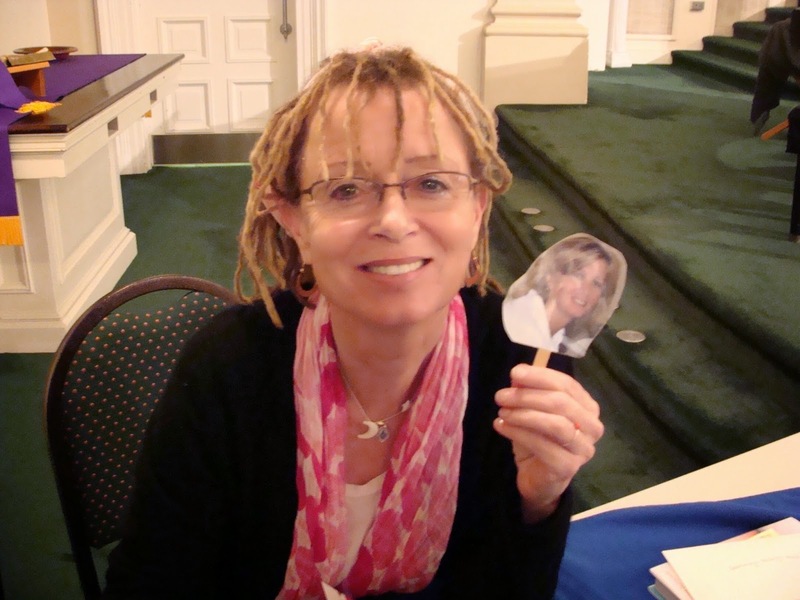 Anne Lamott with Cathy-on-a-Stick. Yes, THE Anne Lamott. Experience has taught me that you don’t need much at a conference. Mostly, you’ll be listening (thus the notepad and writing utensil for a couple notes) and networking (which is where the business cards and Cathy-on-a-Stick come in). I don’t think I’ve ever given a business card to an agent, editor, or publisher. I pass out my cards to writers. I enjoy making friends, connecting with writers from down the road as well as across the country. And Cathy-on-a-Stick…well, that’s just a fun way to make connections. But that’s not what I had in mind when I first thought up Cathy-on-a-Stick. Several years ago, when my daughter was leaving for a faraway college, her close friend pasted a picture of herself on a Popsicle stick. That way, my daughter could take her friend with her wherever she went. Crazy kids, right? But I don’t really “do” candid photos. My hair comes out wonky or a spinach-encrusted smile’s plastered across my face. And it’s an absolute given that one or both eyes will be closed. I’m like a walking disaster area at a conference. And then I remembered my daughter’s little pic-on-a-stick friend. So I searched through all my photos and eventually I found one decent picture of myself. I cut out Cathy and pasted her on a stick. For the next conference, I brought her along because hey, Cathy-on-a-Stick always looks pretty swell, considering that’s it me. And when the inevitable photo opportunity came along, I whipped out that pic-on-a-stick. I’ve never had anyone say no to her. She’s just plain fun—and memorable. I can’t go to a conference—or any writing event—that friends don’t ask about my pic-on-a-stick. And it’s not long before other writers wander over to ask, too. I meet a lot of people, thanks to Cathy-on-a-Stick. Of course, I realize that not everyone is comfortable with such a goofy ice-breaker. But there are other, more subtle routes one can go. I have a writer friend who always wears hats at events. Everyone knows her by her hats, and as a bonus, she’s always easy to find. I have another writer friend who has a purple streak in her hair. Like me, she didn’t plan on the purple hair becoming a “thing,” but she’s kept it because it’s become so identifiable with her. Quirky, unique, and even silly-but-sincere shticks invite conversation. So try something fun at your next conference—an unusual pair of earrings, funky boots, an outrageous scarf. Soon you’ll be talking to your own fabulous folks, passing out your business cards, and making great connections. Oh! And don’t forget to bring your sweater. Friends are great for warm fuzzies, but you’re still going to need a nice, warm sweater in those air-conditioned rooms. Oh, and she's just too famous now, posing with Anne Lamott and all. Anne Lamott. Sigh. I saw her do a book talk in St. Louis and she was spectacular (real AND spectacular, if you're a Seinfeld fan). But you? The cowgirl? How could you not want your picture taken? That's no fair. Hey, maybe I'll cart around a cardboard cut out of me when I was like...twenty...and let people take pictures with that. fun story, really. I thought she was a publicity gag. I had no idea you made her so you wouldn't have to take pictures. Timely posting! I'm in the process of getting ready for the DFW Writers Con next month. Have my cards at the ready! Love the cutout idea but like some others here I am highly allergic to cameras, the one used here is very old, professionally done, and retouched! Absolutely hate pictures of myself. But I do have an avatar I made some years ago. I think I will print her out and use her. Some folks may recognize her since I use her in several places. What a great idea! I am a Christian clown and when people see that on my cards, they always ask what my clown face looks like. What a fun way to take"Jewel" to the. Conferences with me. Thanks for the idea. Fun idea. Conferences are always so much fun. Great idea! I hope I'll meet Cathy-on-a-Stick (and Cathy-for-Real) at a conference some day! Wouldn't it be hilarious if everybody started showing up at conferences with pics-on-a-stick? True story: I met John Scieszka and of course, had Cathy-on-a-Stick along. A few weeks later, I saw a picture of these life-sized photos of Jon's face on a stick. Isn't your pic-on-a-stick trademarked? Didn't you patent that idea? Jon owes you some money (residuals/trademark infringement fees--something). Sue him. Today. Make him rain money down on COAS. Cathy-on-a-stick is so memorable. I never knew how she originated--now I do. What a clever way to meet people--not just Anne Lamott. I need to come up with something for people to remember me by. The sweater advice is also good. Love the Cathy-on-a-Stick. Wish I had thought of that because I'm the same way when it comes to having my picture taken... ack, awful. Friday Speak Out! : Sick? Stop Writing and Rest! Finish Your Draft. . .NOW!